NEW YORK, Feb. 26, 2018 /PRNewswire/ -- iStar (NYSE: STAR) today reported results for the quarter and fiscal year ended December 31, 2017. The Company has also published a supplemental to this earnings release which is available at www.istar.com in the "Investors" section. "2017 was a strong year for iStar. Our accomplishments include successfully delivering significant earnings, executing $2 billion of transformative capital markets transactions that resulted in upgrades by all three credit rating agencies and launching a new publicly traded company focused on reinventing the ground lease business," said Jay Sugarman, iStar's Chairman and Chief Executive Officer. "Our focus now is growing our investment pace and our share price and we have taken several steps to accelerate our momentum in 2018." Net income (loss) for fiscal year and fourth quarter 2017 was $110.9 million, or $1.56 per diluted common share and $(4.9) million, or $(0.07) per diluted common share, respectively. Adjusted income for fiscal year and fourth quarter 2017 was $214.6 million, or $2.57 per diluted common share, and $31.5 million, or $0.40 per diluted common share, respectively. Hired new Chief Investment Officer, Marcos Alvarado, former Head of Acquisitions & Business Operations at Cadre and former Managing Director at Starwood Capital. Increased new loan originations to $457 million during the quarter. Realized $360 million of proceeds from legacy assets in 2017, goal to outpace this amount in 2018. Working with J.P. Morgan Securities LLC to review strategic options for longer-term legacy asset portfolio. iStar reported net income (loss) allocable to common shareholders for the fourth quarter of $(4.9) million, or $(0.07) per diluted common share, versus $(19.3) million, or $(0.27) per diluted common share for the fourth quarter 2016. Adjusted income allocable to common shareholders for the fourth quarter was $31.5 million, or $0.40 per diluted common share, versus $2.7 million, or $0.04 per diluted common share for the fourth quarter 2016. Adjusted income represents net income computed in accordance with GAAP, prior to the effects of certain non-cash items. The calculation of adjusted income and reconciliation to GAAP net income are presented in the financial tables that follow the text of this press release. For the full year 2017, net income allocable to common shareholders was $110.9 million, or $1.56 per diluted common share, versus $44.0 million, or $0.60 per diluted common share for the full year 2016. Adjusted income allocable to common shareholders for the full year was $214.6 million, or $2.57 per diluted common share, versus $112.6 million, or $1.15 per diluted common share for the prior year. On January 1, 2018, new accounting standards related to partial sales of non-financial assets became effective. The Company will adopt this standard using the modified retrospective approach, in which it will record a cumulative adjustment to equity on January 1, 2018 in lieu of recasting prior financial periods. Specifically, the Company expects to record an incremental gain to beginning balance of GAAP book equity of approximately $76 million, or approximately $1.10 per basic common share, in the first quarter. The adjustment relates to previously unrecognized gains from prior asset sales, including the sale of the Company's ground lease assets to Safety, Income & Growth in 2017. The Company will reflect these cumulative gains in its adjusted income metrics for the first quarter of 2018.
iStar announced that it has hired Marcos Alvarado as its Chief Investment Officer and a member of its senior executive team. Mr. Alvarado has closed more than $25 billion of investments across all parts of the capital structure and will leverage his extensive experience to help the Company identify opportunities and grow its core businesses. Mr. Alvarado was previously Head of Acquisitions & Business Operations for Cadre and a Managing Director at Starwood Capital. "Marcos brings top tier real estate investment experience to our company and offers a unique perspective for iStar's creative strategies," said Sugarman. "In the short time he's been with the team, he has already made important contributions to our unique platform. In addition, I am happy to announce that we have appointed Nina Matis as Vice Chairman in addition to her responsibilities as Chief Legal Officer." At December 31, 2017, the Company's portfolio totaled $4.9 billion, which is gross of $356 million of accumulated depreciation and $18 million of general loan loss reserves and includes $120 million market value of SAFE shares as of December 31, 2017 versus carrying value of $84 million. iStar's portfolio includes its core businesses of real estate finance, net lease, and SAFE as well as non-core businesses of operating properties and land & development. During the fourth quarter of 2017, the Company invested a total of $504 million in new investments, prior financing commitments and ongoing development across its four segments, and generated $335 million of proceeds from repayments and sales. iStar's real estate finance business targets sophisticated and innovative investors by providing one-stop capabilities that encompass financial alternatives ranging from full envelope senior loans to custom-tailored mezzanine and preferred equity capital positions. At December 31, 2017, the Company's real estate finance portfolio totaled $1.3 billion. The portfolio is categorized into iStar 3.0 loans, made post January 1, 2008, and legacy loans, which were all made prior to December 31, 2007. During the quarter, the Company closed on $457 million of loan originations and funded $405 million associated with these deals and prior financing commitments. Note: Gross book value represents the carrying value of iStar's loans, gross of general reserves. (1) Includes performing loans only. iStar's net lease business seeks to create stable cash flows through long-term leases to single tenants on its properties. The Company targets mission-critical facilities leased on a long-term basis to tenants, offering structured solutions that combine iStar's capabilities in underwriting, lease structuring, asset management, and build-to-suit construction. At the end of the quarter, the book value of iStar's net lease portfolio totaled $1.3 billion, gross of $292 million of accumulated depreciation. The portfolio was comprised of $1.1 billion of wholly-owned assets, a $121 million equity investment in its net lease joint venture and $120 million market value in shares of SAFE. Since 2014, the Company has invested in new net lease investments primarily through its net lease joint venture with a sovereign wealth fund, in which it holds a 52% interest. At the end of the quarter, the venture's balance sheet, gross of $48 million of accumulated depreciation, included $691 million of assets, $406 million of liabilities and $224 million of equity (net of a $13 million non-controlling interest). The investment period for the fund expires on March 31, 2018. During the quarter, the Company sold an office property with a remaining lease term approaching five years in Sunnyvale, CA for $100 million and generated a $62.5 million gain. In addition, the Company recorded a $5.3 million impairment on one net lease asset based on a change in business plan. iStar is the founder, largest shareholder and manager of Safety, Income & Growth Inc. (NYSE: SAFE), the first and only publicly traded company to focus on ground leases. 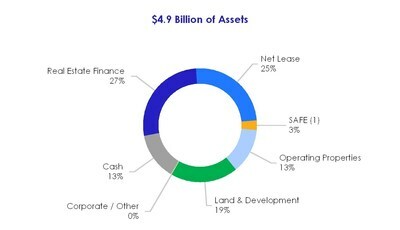 Ground leases provide a unique mix of principal safety, growing dividends and the potential for significant capital appreciation. iStar held 6.8 million shares, or 37.6% of the shares outstanding, at the end of the year. During the fourth quarter, the Company purchased 0.5 million shares of SAFE for $9.6 million. Subsequent to the end of the year, iStar purchased an additional 0.4 million shares for $7.6 million, bringing its ownership up to 39.9% of shares outstanding. SAFE is seeking to reinvent how ground leases are utilized in the $7 trillion institutional commercial real estate market. These efforts are beginning to gain traction, as SAFE has recently closed on two transactions that demonstrate how SAFE Ground LeasesTM can be a better way for real estate investors, developers and acquirers to capitalize their projects. As of its most recent report, SAFE's pipeline stood at nearly $1 billion, including $72 million of deals under LOI. At the end of the quarter, iStar's operating property portfolio totaled $629 million, gross of $55 million of accumulated depreciation, and was comprised of $580 million of commercial and $49 million of residential real estate properties. The Company's commercial operating properties represent a diverse pool of assets across a broad range of geographies and collateral types including office, entertainment and hotel properties. These properties generated $25.4 million of revenue offset by $21.1 million of operating expenses during the quarter. At the end of the quarter, the Company's land & development portfolio totaled $933 million, including 8 master planned communities, 6 waterfront projects and 14 urban/infill developments. These projects are collectively entitled for approximately 12,500 lots and units. For the quarter, the Company's land and development portfolio generated $18.2 million of revenues, offset by $15.0 million of cost of sales. In addition, the Company recorded a loss of $1.1 million from land development equity method investments. During the quarter, the Company invested $40.3 million in its land portfolio. During the quarter, the Company recorded a $10.5 million impairment associated with its Coney Island amphitheater. The impairment is related to the slower than expected ramp up of revenues at the amphitheater and restaurant. As previously reported, iStar executed a comprehensive series of capital markets transactions during the third quarter of 2017 which enhanced the Company's overall financial position, extended its debt maturity profile, lowered its cost of capital and resulted in upgrades from all three credit rating agencies. Near the end of the third quarter, the Company issued three series of notes totaling $1.09 billion. Proceeds from the issuances, together with cash on hand, were used to repay $1.15 billion of notes and $240 million of preferred stock at the beginning of the fourth quarter. As a result, the Company recorded a $9.0 million one-time prepayment penalty on the early redemption of these notes in the quarter. Subsequent to the end of the year, the Company purchased approximately 0.7 million shares of STAR under its 10b5-1 share repurchase program for $7.1 million. Following these purchases, the Company had $42.9 million remaining under its share repurchase authorization. (1) Represents aggregate liquidation preference. accumulated depreciation and amortization relating to equity method investments. The Company seeks to match funds its balance sheet to help insulate from the impact of rising interest rates. At the end of the year, the Company had $789 million of floating rate loans and $499 million of floating rate debt, net of repaying its revolving credit facility. As a result, a 25 basis point increase in LIBOR would result in an approximately $1 million increase to full year net income. The Company's weighted average cost of debt for the fourth quarter was 5.1%. The Company's leverage was 2.1x on an actual basis at the end of the quarter, on the low end of the Company's targeted range of 2.0x - 2.5x. The chart below shows the calculation of the Company's leverage. (1) Includes aggregate liquidation preference of preferred equity. The Company continues to maintain a healthy liquidity position. Unrestricted cash at the end of the quarter was $658 million, which is available for new investment activity and working capital. Since 2012, the Company has generated $2.5 billion of proceeds from the sale of legacy assets and recorded net gains of approximately $700 million. Today, the non-core, legacy portfolio, comprised of primarily land & development, operating properties and NPLs, has been reduced to $1.7 billion. For 2018, the Company is targeting to generate over $400 million of proceeds from legacy asset monetizations. In addition, the Company is working with J.P. Morgan Securities LLC to explore alternatives for the balance of the legacy asset portfolio. Alternatives may include accelerated sales of individual assets or groups of assets, and structural alternatives such as a spinoff and/or joint venture. As part of this review, the Company is also looking at opportunities to reduce its G&A. There can be no assurance that the Company's review of alternatives for the legacy portfolio will result in any transaction. iStar will hold a quarterly earnings conference call at 10:00 a.m. ET today, February 26, 2018. This conference call will be broadcast live on iStar's website, www.istar.com. To listen to the live call, please go to the website's "Investors" section at least 15 minutes prior to the start of the call to register, download and install any necessary audio software. For those who are not available to listen to the live broadcast, a replay will be available shortly after the call on iStar's website. Note: Statements in this press release which are not historical fact may be deemed forward-looking statements within the meaning of Section 27A of the Securities Act of 1933 and Section 21E of the Securities Exchange Act of 1934. Although iStar believes the expectations reflected in any forward-looking statements are based on reasonable assumptions, the Company can give no assurance that its expectations will be attained. The Company undertakes no obligation to update or revise publicly any forward look statements, whether as a result of new information, future events or otherwise. Factors that could cause actual results to differ materially from iStar's expectations include general economic conditions and conditions in the commercial real estate and credit markets, the Company's ability to generate liquidity and to repay indebtedness as it comes due, additional loan loss provisions, the amount and timing of asset sales, changes in NPLs, repayment levels, the Company's ability to make new investments, the Company's ability to maintain compliance with its debt covenants, the Company's ability to generate income and gains from operating properties and land and other risks detailed from time to time in iStar SEC reports. (1) For the three months ended December 31, 2017 and 2016, includes $6,081 and $3,245 of stock-based compensation expense, respectively. For the twelve months ended December 31, 2017 and 2016, includes $18,812 and $10,889 of stock-based compensation expense, respectively. (2) Participating Security holders are non-employee directors who hold common stock equivalents and restricted stock awards granted under the Company's LTIP who are eligible to participate in dividends. Note: In addition to net income (loss) prepared in conformity with GAAP, the Company uses adjusted income, a non-GAAP financial measure, to measure its operating performance. Adjusted income is used internally as a supplemental performance measure adjusting for certain non-cash GAAP measures to give management a view of income more directly derived from current period activity. Adjusted income is calculated as net income (loss) allocable to common shareholders, prior to the effect of depreciation and amortization, provision for (recovery of) loan losses, impairment of assets, stock-based compensation expense, the non-cash portion of gain (loss) on early extinguishment of debt and is adjusted for the effect of gains or losses on charge-offs and dispositions on carrying value gross of loan loss reserves and impairments ("Adjusted Income"). In the third quarter 2017, the Company modified its presentation of Adjusted Income to exclude the effect of the amount of the liquidation preference that was recorded as a premium above book value on the redemption of preferred stock and the imputed non-cash interest expense recognized for the conversion feature of its senior convertible notes. Adjusted Income should be examined in conjunction with net income (loss) as shown in our consolidated statements of operations. Adjusted Income should not be considered as an alternative to net income (loss) (determined in accordance with GAAP), or to cash flows from operating activities (determined in accordance with GAAP), as a measure of our liquidity, nor is Adjusted Income indicative of funds available to fund our cash needs or available for distribution to shareholders. Rather, Adjusted Income is an additional measure we use to analyze our business performance because it excludes the effects of certain non-cash charges that we believe are not necessarily indicative of our operating performance while including the effect of gains or losses on investments when realized. It should be noted that our manner of calculating Adjusted Income may differ from the calculations of similarly-titled measures by other companies. (1) Depreciation and amortization includes our proportionate share of depreciation and amortization expense relating to equity method investments and excludes the portion on depreciation and amortization expense allocable to non-controlling interests. (2) Impairment of assets includes impairments on equity method investments recorded in earnings from equity method investments. (3) Losses on charge-offs and dispositions represents the impact of charge-offs and dispositions realized during the period. These charge-offs and dispositions were on assets that were previously impaired for GAAP and reflected in net income but not in Adjusted Income. (1) Excludes $6.1 million of stock-based compensation expense. (1) Excludes $102.1 million of commitments on loan participations sold that are not the obligation of the Company but are consolidated on the Company's balance sheet. (2) Gross carrying value represents iStar's carrying value of loans, gross of loan loss reserves. (1) Based on carrying value of the Company's total investment portfolio, gross of accumulated depreciation, general loan loss reserves and market value of its investment in shares of SAFE stock.